This short ride is sure to put a smile on your face. This is a perfect introduction to the totally pawsome world of dogsledding. Taking time stopping to enjoy the views and explore Dinner Plain like you have never seen before! After your ride be sure to thank your lovely dog team with lots of pats, cuddles and pictures! Get ready for a tail wagging good time as you find magic around every corner on the looped trails of Dinner Plain. The dog's excitement is contagious as you dash through the snow, so snuggle up and get ready to learn all about the history of the sport, linage of the dogs and the ultimate bond between man and their best friends. Journey upwards to discover remarkable views of untouched beauty then under archways of painted snow gums. 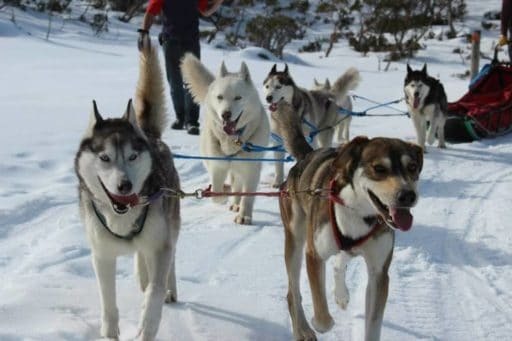 If you’re feeling brave your experienced musher will let you have a go at driving! From the cheeky to the driven, our dogs are sure to make memories so finish the tour off with a pat and play to say thank you. The dogs will be sure to load you up with plenty of kisses to remember them by. This tour is great for all ages and abilities.